Having worked in 100+ data centres, we have had ample opportunity to refine our practices. We have seen our project approach and execution advance dramatically over the past ten years, evolving to suit changing technologies, and improving with our own experience. We are also aware of what successful CFD projects require to ensure consistent success. Monitoring and DCIM tools alone aren’t a complete solution; they can tell you what went wrong, but not necessarily why. CFD analysis can give you the reason for failure as well as the solution. Cold-aisle containment is a prime example. When it works, it is great – but when it fails, you’ve invested a lot of time and money on an ineffective solution that could actually have made things worse. Our rule is to test all big changes with your calibrated CFD model first, at no risk to your actual data centre – making sure you only get the best results from your investments, and don’t waste money on equipment that won’t help you! We compare our CFD models against real-life airflow and temperature measurements, and we show you the results! Only when the model corresponds closely with reality can it be used as a baseline tool to predict future changes. If you’re still in the design phase of your data centre build, we can complete this calibration during your Integrated Systems Test (IST). 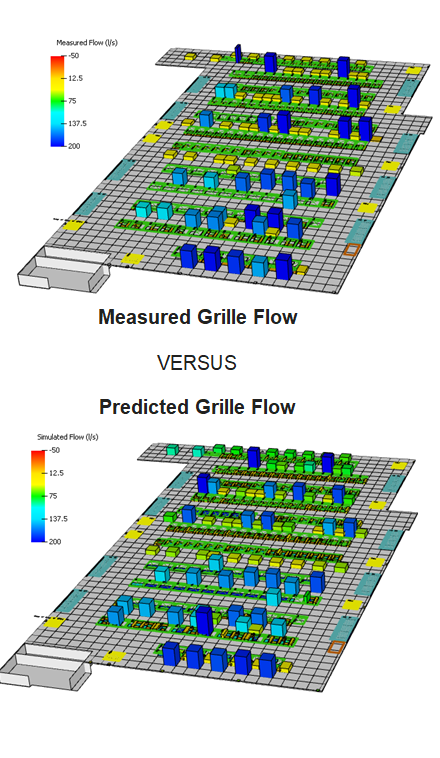 The images show a measured versus predicted air flow through the floor grilles.